On May 2nd, 2014 Odessa witnessed clashes between the people opposing the authorities who came to power as a result of the Maidan victory, and radical and national groups together with the members of the rally “for territorial integrity of Ukraine.” The clashes started around Grecheskaya Street and Sobornaya Square killing two nationalists and four oppositioners. Later, nationalists moved to the Kulikovo Field, where the Anti-Maidan camp was set up. To this day, no one knows how the idea to seek refuge at the Trade Union building emerged. But the people, who went there, in fact, became trapped. The Trade Union building was set on fire. The radicals did not let the opposition members leave the building. Some people jumped out of the windows trying to escape fire and smoke. Those jumpers who survived were finished off after landing. Later, the information was provided that radicals not only blocked the exit, but entered the building to finish off all survivors. That evening Kulikovo Field took the lives of 42 people. If one takes into account the victims on Sobornaya Square, a total of 48 people was killed. 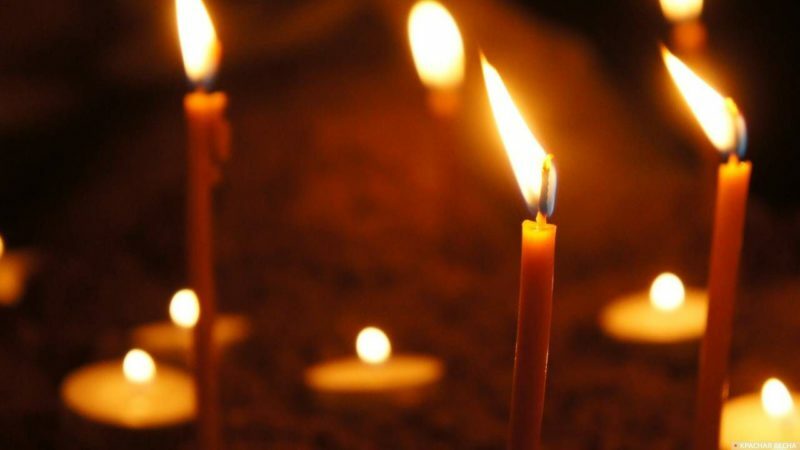 Every year on May 2nd, the people from the city of Odessa and other cities celebrate the memory of the people, who died during those clashes. This year, as in the previous ones, the authorities whipped up tensions in all possible ways before the tragic anniversary. Additional internal affairs units were pulled in the city, armored vehicles appeared on the streets. Kulikovo Field was cordoned off and examined by bomb experts. According to Internal Affairs Ministry, 2,500 police officers and militarized police officers were deployed to guard the Trade Union building. At about 10 am the people were admitted to the Trade Union building. The same as last year, everyone wishing to get to Kulikovo Field had to undergo a security check. Metal detectors were installed at the entries. One of metal detectors bore a reminder about a legislative prohibition of the Communist symbols. The poster showed the portrait of Lenin and Stalin, the Soviet coat of arms and state flag of the USSR, as well as Ribbon of the Guards and a Young Pioneer scarf. All the symbols were crossed out. Despite the fact that May 2nd is now a working day (in December 2017 Verkhovna Rada changed the day off on May 2nd into December 25, the Catholic Christmas Day), the citizens continued to arrive all day long. Many people came there in the evening after the end of the working day. One could see Odessa residents of all ages. Almost all the people carried flowers. At about 1 pm, radicals started to carry out provocations. A quadrotor drone appeared in the air above Kulikovo Field carrying a red-and-black flag. About a dozen far-right radicals came to the Trade Union building, who did not hide their participation in the clashes, and dishonored the memory of the people who perished. Later, the information arrived that an Odessa resident was beaten by nationalists. He was going towards the Trade Union building carrying flowers. After he was beaten, the victim, in the best traditions of modern Ukraine, was detained by the police. After that, two far-right radicals were also delivered to the district police department. There were no other confrontations. This year, according to media, the situation around Kulikovo Field was more peaceful than in the previous years. At 4 pm the event to commemorate the memory of May 2nd, 2014 victims started. White doves with black balloons were released into the sky. The people released 48 balloons, according to the number of people, who died in that clash. Some of the rally members wore T-shirts with the pictures of the victims. Commemoration events took place in many other cities as well. In Ukraine (in particular, the cities of Dnepropetrovsk and Lvov released black balloons into the sky) and in Russia, as well as in a number of the cities of neighbouring CIS countries and non-CIS-states. At 6 pm next to the Odessa memorial to Taras Shevchenko “the Ukrainian order” marching started. The Internal Affairs Ministry informed of about 700 people from Svoboda (Freedom) and National Corpse parties taking part in the demonstration, as well as representatives from a number of other far-right organizations. The majority of the members of the demonstration came here from other cities. And the members did not try to hide this fact. The far-right members walked along the central streets of the city of Odessa. They chanted slogans “Moskals to dagger”, “Odessa is Ukraine”, “Glory to the nation, death to the enemies” and etc. There were no confrontations recorded during the demonstration, but Internal Affairs Department reported detention of a man, possessing an item very similar to the grenade near the place where the column of people was passing. The demonstration ended with the rally on Sobornaya Square, where the clashes started on May 2nd, 2014. The speakers seemed to be competing each other in humiliating the victims and the city in general, as well as in offensiveness of their statements. Head of the local Ukrainian Neo-Nazi organization “Right Sector” (organization banned in Russia) speaking at the rally showed outrage that power in Ukraine is being controlled by Jews. Head of Svoboda party, Tyagnibok, present at the event, said that May 2nd has to become “a national holiday.” The rally ended with chanting a “prayer” of Ukrainian nationalist. Almost all the speakers supported the idea that May 2nd has to become “a national holiday.” Some people were not hiding the fact that they participated in that clashes. This situation has to be discussed more thoroughly. The more time passes, the more openly radicals start to describe their participation in the clashes. Nevertheless, despite all their confessions and proof available, only the regime opposition members were put on trial regarding the case of May 2nd. Two of them have been staying at the detention center for almost four years already. The case has been artificially delayed. On September 28, 2017, Ilyichevsk District Court of the Odessa region, despite the pressure of prosecutor’s office and far-right forces, freed 19 members of anti-government rallies from charge, but the prosecutor’s office appealed against the judgment immediately, which probably will delay the process for a number of years ahead. According to the prosecutor’s office, one of the Anti-Maidan members is guilty in the fire at the Trade Union building. But it seems that the case about the fire has been “buried” forever. In January 2017 the head of Odessa regional department of the Ministry of Internal Affairs said that the major part of evidence had been lost. The attempts to hold the “Euro-Maidan member” Goncharevsky accountable turned to be predictably unsuccessful. He was recognized at the video evidence to be finishing off the people jumping out from the Trade Union building. Goncharevsky was arrested on August 19, 2014, but released ten days after under the pressure of radical and nationalist groups upon the court. Then he became a fighter of Kiev junta’s punitive operation in Donbass and the criminal case was closed. Another Euro-Maidan member Khodiyak’s case died out the same way. The latter shoot one of the regime opposition members during the clashes on the Sobornaya Square. The other cases against Euro-Maidan members were also put aside. The question about accountability for the death of people is asked only on paper. The question about the organizers of these clashes is not even asked. Nevertheless, it does not mean that one can forget the Odessa tragedy. The memory of that events will become a warrant that eventually the people taking part in the atrocities of May 2nd will be held accountable. This entry was posted in News from Ukraine and tagged Abroad: The Real World, Bandera Nazism, the Odessa massacre on May 2, Ukraine. Bookmark the permalink.